Anthony Spence, 44, and Saverna Bias, 53. 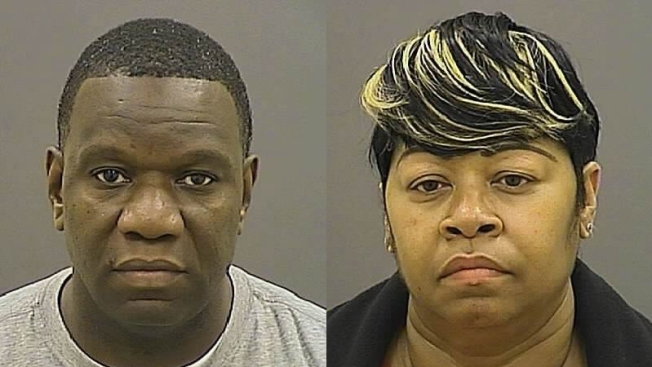 Two Baltimore schools police officers have been charged after cellphone video surfaced showing one of them slapping and kicking a teen at a school while the second officer stood by. Anthony Spence, 44, and Saverna Bias, 53, turned themselves in Tuesday night, city police announced in a statement Wednesday morning. Both are charged with second-degree assault and misconduct in office. Spence is also charged with second-degree child abuse. Online court records show both posted bond and were released Wednesday. Spence acknowledged in a telephone conversation with The Associated Press on Friday that he was the subject of a criminal investigation into the actions captured on cellphone video last week at the REACH Partnership School. Spence said last week that he wouldn't discuss the matter because the news media would "twist" the story. "Right now I'm the bad guy," he said. He referred questions to his lawyer, Michael Davey, who didn't immediately respond to a phone call Wednesday morning. City police began a criminal investigation into last week's incident at the school after the eight-second clip surfaced. The school district has its own police force separate from city police. The school police department is handling the internal investigation and city police said in the statement Wednesday that case is now in the hands of the city's State's Attorney's Office's public integrity unit. School officials initially said officers responded to a reported intruder, and that the young man in the video wasn't a REACH student. On Friday, the school system said in a statement that he is "believed to be a student on the school's roster," as asserted by his lawyer, Lauren Geisser. Geisser has said he's a 10th-grader. On Monday, Baltimore City Schools CEO Gregory Thornton met with parents to discuss the video and said he will review training and selection of school police officers. Spence and a female officer seen in the video standing by were put on paid administrative leave. School Police Chief Marshall Goodwin is also on leave, but officials have not said why.